Posh manager Graham Westley (centre), chief executive officer Bob Symns (left) and director of football Barry Fry (right) at the club's Annual General Meeting. Photo: Joe Dent/theposh.com. Peterborough United manager Graham Westley insists director of football Barry Fry is a great asset to the football club. Fry’s annual salary as the highest paid Posh director - it rose from £71k for the year ending June 2014 to £220k for the year ending June 2015 - was the subject of an early question at the club’s Annual General Meeting today (December 21). The £150k increase was down to commission paid on the sales of Dwight Gayle (for £6m to Crystal Palace) and Britt Assombalonga (£5.5m to Nottingham Forest). Fry conducts all transfer negotiations on behalf of Posh. And Westley said: “Barry Fry is a great asset to this football club. He is a one-man nationwide network. He knows everyone in football at every level. “Last week I mentioned a young player to him (believed to be 21 year-old Histon winger Jordan Nicholson) and he turned up to train with us this morning. “Recently I mentioned Martin Samuelsen to Barry and he was soon in the door as well. Barry has a wealth of contacts in the game that is unrivalled by anyone. He knows people at every level and he knows how to work with them. The official AGM business lasted just 12 minutes and saw Fry and company secretary Ted Hennessey re-elected to the club’s board. Posh made a loss of £1.9m in the last accounting year and remain heavily dependent on the financial support of chairman/owner Darragh MacAnthony. Chief Executive Officer Bob Symns answered questions on ticket office opening hours and on the potential redevelopment of the London Road End at the ABAX Stadium. Symns confirmed that the club’s preferred re-development option is a stand to match the Motorpoint Stand at the other end of the ground, but timing and financial issues might forced the use of seats bolted onto the existing terrace steps. The letter would be the probable outcome if Posh were to win promotion back to the Championship this season when an all-seater ground would be compulsory. Peterborough City Council have funds in place to assist with this. 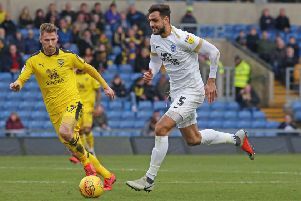 Westley accepted questions from the floor and insisted Posh fans shouldn’t be scared of January player sales as he remained confident he would still be left with a squad capable of winning promotion. The Posh boss was also quick to defend Marcus Maddison over one shareholder’s claim that the player was ‘dead meat on a live pitch,’ on account of his injury problems. Westley also revealed that on-loan left-back Callum Elder was today having a scan on the foot injury he collected in Saturday’s (December 19) League One defeat at Blackpool and that central defender Jack Baldwin, who hasn’t started a game for over 13 months, regards himself as 90% fit. The manager would only start Baldwin out of necessity as a result. Young goalkeeper Dion-Curtis Henry has been called up into an England age group training squad in the new year.